Stacking the Shelves (#41): Going overboard! 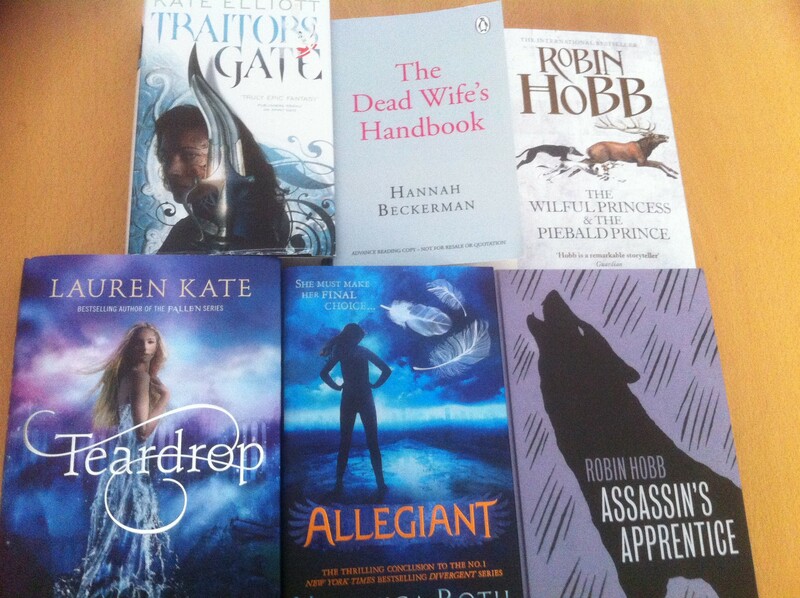 I may have gone a little overboard on the book buying front this week! I went to a Robin Hobb signing and so picked up her latest book, The Willful Princess & The Piebald Prince, and while I was there I just couldn’t resist this copy of Assassin’s Apprentice. Although I already own the original edition, I’ve been eying this edition up for ages, and I knew in all likelihood I’d cave and buy it eventually – so I figured I might as well buy it while I could get it signed! I wasn’t actually planning to buy Allegiant this week, but it got to the point where I felt like I couldn’t turn around without seeing spoilers, and so I ended up buying a copy just so I could read the ending spoiler-free. Am I the only person who finds that a bit…well, sad? I would be mortified if I accidentally gave away an ending to someone! Teardrop and Traitor’s Gate were both impulse buys – Teardrop was £5 in Asda and Traitor’s Gate (though a little battered) was 50p in The Works. The Dead Wife’s Handbook was a review copy from Real Readers which is so far very very sad!